Last week was exceptionally busy, but one highlight was the opportunity to hear two of today's greatest mathematicians, Sir Timothy Gowers and Sir Roger Penrose, deliver the London Mathematical Society's Popular Lectures in central London. (There is another opportunity to hear them in Birmingham on 26 September, and the lectures are normally made available on DVD). This was a wonderful opportunity to hear two top mathematicians talking about their views of mathematics. Both talks took their theme from the Turing centenary, a reminder of just how important a contribution Turing made to the culture and practice of contemporary mathematics. Gowers was talking about the possibility of computers becoming mathematicians, in the sense of creating and proving theorems. He was particularly interesting in his analysis of two fairly well-known mathematics puzzles which can be solved by the right insight. What Gowers did here was to show how these insights can be understood, not as a sudden creative spark from nowhere, but as the consequence of an understandable line of mathematical thinking. This was fascinating, and empowering: these kind of insights don't need incomprehensible strokes of brilliant genius but could be accessible if you think hard enough about the problem. Gowers predicted that in 50 years time computers will be able to do mathematical research better than humans. He didn't discuss how mathematicians will react to this. If pure mathematics can be created by humans, will people still want to do it? This kind of mathematics is already an esoteric pursuit: if one is doing world-leading pure mathematics it is unlikely that more than a small number of people are actively engaging with your work. If computers are doing it better, will human mathematicians still see it as a worthwhile activity to devote their life to? Penrose talked about consciousness. His argument, as I understand it, is that human consciousness is not subject to the limitations that Godel's Theorems show apply to formal systems, and that we need a new theory that goes beyond quantum theory in order to understand consciousness. He presented a toy model universe to show that the universe need not be computable - the toy model certainly proved that it is possible to have uncomputable universes - but I am unconvinced by his arguments. Although I am not qualified to disagree with Penrose, who knows much more and has thought much more deeply about these subjects than I do, I don't think his arguments are valid. I do not understand why he thinks Godel's Theorems do not apply to human thought. His assertion seems to be based on a claim that humans can always jump "outside the system" to see implications that are not formally consequences of a logical system, so there can be no "Godel sentence" that is true but which human consciousness cannot prove to be true. I don't understand why he can be confident of this, so I don't see that consciousness presents a problem for quantum theory. Nor do I share the worries he expressed that the Measurement Problem in quantum theory. Everett's interpretation, that we view only one branch of the universal wavefunction, seems to me to be a perfectly logical solution to the Measurement Problem - we don't have to accept it, but it does show that a solution is possible, in the same way that Penrose's toy model uncomputable universe makes its point. Regardless of whether .I was persuaded by the speakers, this was an exciting and stimulating evening which kept a huge audience engaged for the whole of a long evening. Well done the LMS! 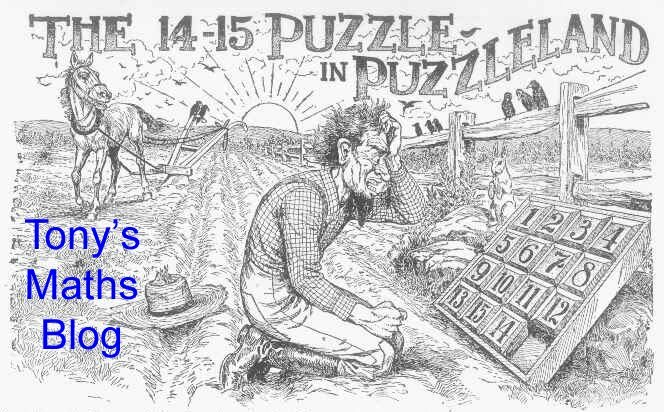 Any clues as to what were the two puzzles or problems Gowers considered? As I understand it, the Penrose talk seems to have been drawn from his book "The Emperor's New Mind". I haven't read it, but I have seen Daniel Dennett's riposte in "Darwin's Dangerous Idea". Dennett suggests the following analogy to human mathematical reasoning: a computer playing chess cannot, in practice, perfectly search the whole super-astronomically large gamespace, but they do use heuristics that work superbly. In a similar way, humans use good heuristically reasoning that isn't a formal logic system which Godel's theorems would affect. The first problem was to tile with dominoes a chessboard with two diagonally opposite corner squares removed. The second was to estimate the value of sqrt(10001)-sqrt(10000) ("sqrt" meaning square root). In both cases there is a "clever" solution if you haev the right insight, and Gowers showed how one could plausibly arrive at that insight by logic rather than by a flash of inspiration. Penrose has new ideas and alludes to new research but basically his argument, I thin, is still that of "The Emperor's New Mind".